We should start from the objective. Why do we need to personalize our products? We all have different objectives. LTV, MRR, increasing engagement, reducing churn...etc. To measure your progress toward the objective, it's always better to have one metric. 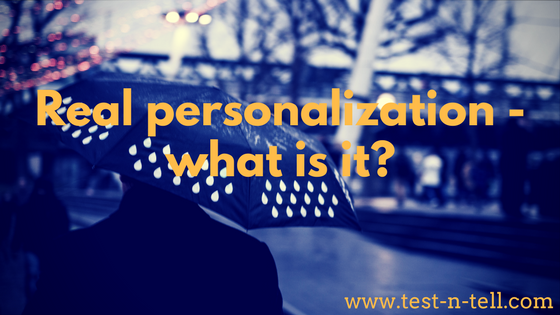 Let's say that our personalization metric is customer satisfaction. We all know that the certain way to a business success is to build a product your customers would love. Customer satisfaction is the metric that helps you measure this goal. One way to measure customer satisfaction is the NPS. Real personalization = right content in a right context. What could we call the right content? First and foremost, make sure a person explicitly allowed you to send a content. You can't do much worse than to spam people without their permission. Content serves a user's goal. A user wants to make progress in her life and content should help with that. How could a context be right? Good timing is the first component of the right context. A calendar event reminder is useful because it pops up before the meeting. Locational awareness is an important element of the right context. Uber shows us (although not always accurate) where we are so it's much simpler to use their service. Arguably the most difficult part of the right context is the situational awareness. GPS navigation systems should proactively inform me about the traffic jam while I still have a chance to escape it. Let's take "Google Now" as an example. This product is one of the solid examples of the near-real personalization. "Google Now" serves different kinds of content but we'll take one of the simplest - a weather forecast. My experience starts when I ask Google for a weather forecast. I just say: "what's the weather like?" Google knows what time is now and where I am. So it's a straightforward answer. - Do you want to be notified about the weather in your location? - Google asks after it served the answer to my initial question. This is appropriate permission prompting. I agree and therefore give Google permission to send me content. Next morning the weather changes. Three days in a row the sun was shining, but today it's going to rain after lunch. Before leaving home, Google reminds me to take an umbrella to stay dry. Where am I - is it a "home? Where would I go - would it rain there? I need to be reminded about the umbrella preferably when I am packing for the day. After I left home = fail and long before may also mean fail as I might acknowledge and then still forget about the reminder. In a perfect universe of real personalization, I receive the umbrella reminder exactly when I am putting my coat on standing next to the entrance door and umbrella's holder. "Google Now" does not work like this yet. Despite having endless computation power and tons of data about me - this level of personalization still hard to achieve. But we're getting to the tipping point of the real personalization. Start from the basics. Make sure your content is useful and desirable. Then try some basic context personalization. Sending content at the right time, location and in the relevant situation. Most importantly, have the respect for your customers - it's all about their context and value, not yours.